An Indian Egg Omelette is generally made with onions, green chillies / chilli powder or combination of both and cilantro/coriander leaves. I like to add some veggies like capsicum/bell pepper, carrot etc. which makes the omelette healthy and tasty. 1. Finely chop onions, capsicum, cabbage, tomatoes, green chillies and cilantro. Grate carrot. You can use any veggies of your choice. 2. Break the eggs and pour it in a bowl. Whisk/beat (with a spoon/fork) the egg till the yolk is mixed well. Add salt, black pepper powder, chopped green chillies, all chopped veggies and whisk again. 3. Heat nonstick pan, applay oil and pour this mixture on the pan and spread it with the spoon. Drizzle little oil and flip the other side after a minute or so. Roast both sides till golden brown. 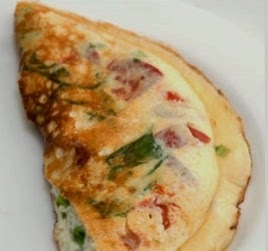 Serve Veggie Egg Omlette with bread and tomato ketchup. with this recipe u can prepare 3 omletts. · U can add red chilli powdre instead of green chillies or combination of both. · Adjust spice and salt as per your requirement.